Yotam Ottolenghi is a chef with a rare facility for food that looks gorgeous and feels inevitable. His recipes have a knack for the just right, even as they lead you down slightly twisty paths and wheedle you into a few exotic ingredient purchases. He and his coauthor, Sami Tamimi, honed this skill for gorgeous, crave-worthy food and added a wealth of cultural depth to it in Jerusalem, their much-lauded book that pays tribute to the Palestinian, Israeli, and Christian influences in the city鈥檚 food. One of those recipes is this one 鈥� a recipe that whispered its way into my ear, thanks to several in-the-know food friends who knew I was searching for chicken dinner showstoppers. This was a late addition to my roster of favorites, but now it鈥檚 never leaving. Will you give me a moment to convince you to try it too? 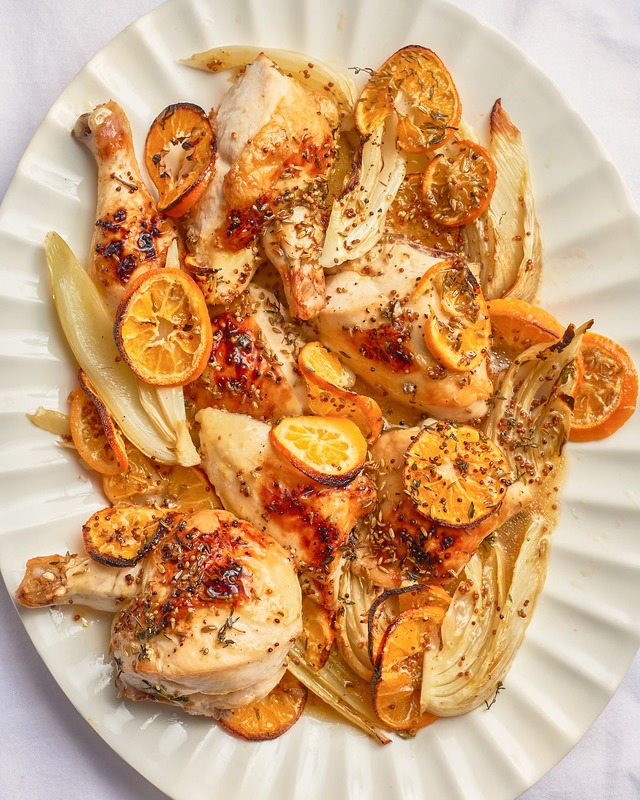 What Is Ottolenghi鈥檚 Roast Chicken with Clementines? This recipe was suggested to me several times by friends in the food business 鈥� people who write and edit cookbooks and just know good food from the page to the plate. I am glad I had the good sense to listen. 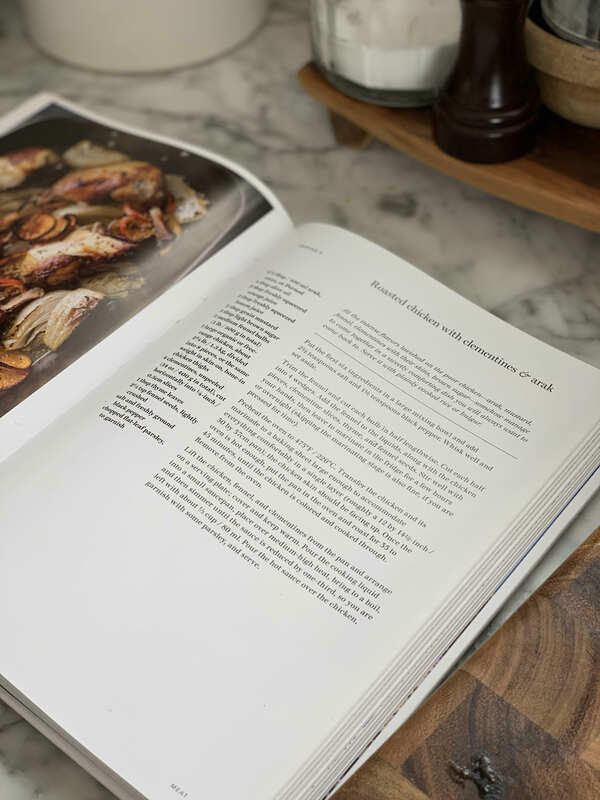 The most challenging part of this recipe comes right up front in the sourcing. It calls for arak, a Middle Eastern liquor that tastes intensely of anise. 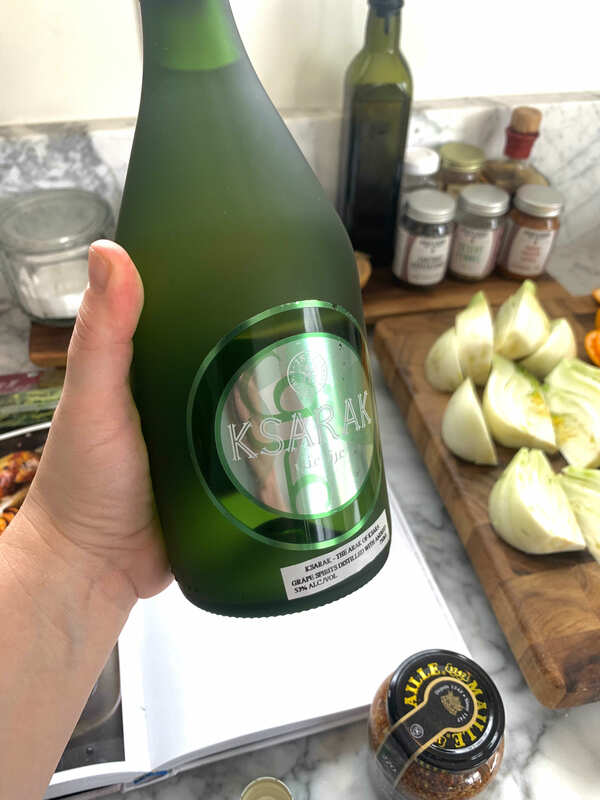 In fact, if you like anise, you will be thrilled at this recipe, which also includes fresh fennel and fennel seed, along with this liquor. I found this liquor relatively easily at my liquor store (and it was inexpensive!) but if you can鈥檛 find it, then Greek ouzo or French Pernod are good substitutes. From there it is a high-key version of what we call a 鈥渄ump and stir鈥� recipe. Into a bowl goes the arak, then olive oil, orange and lemon juices, whole-grain mustard, and brown sugar. Toss this saucy goodness with the meat of the recipe: quartered fresh fennel and bone-in chicken pieces (I used thighs). 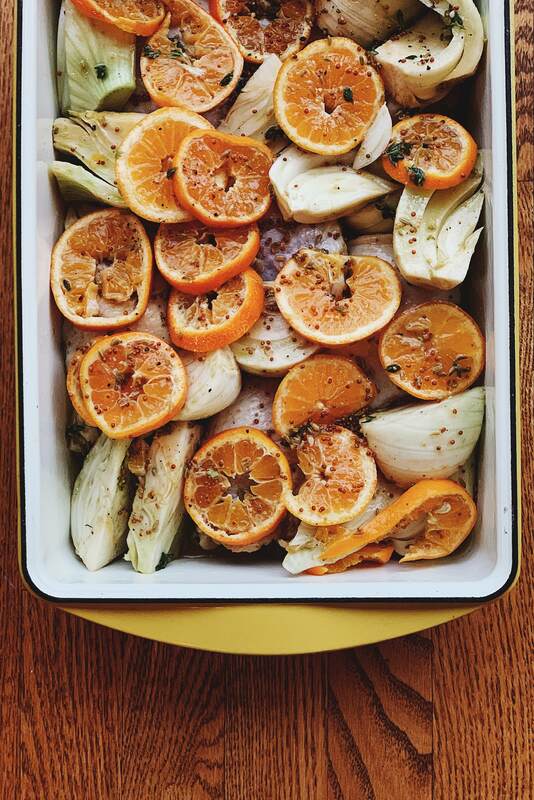 Then the fruit and aromatics go in: sliced clementines, fennel seeds, thyme leaves, and salt and pepper. From start to finish, putting this together took me about 10 minutes. So easy, and beautiful too. It is supposed to rest in the fridge for a few hours or overnight, although Ottolenghi recognizes that you might be pressed for time and gives allowance to put it straight into the oven (I love this kind of thoughtfulness in a recipe). But it鈥檚 so cool to just wrap this up and pop it in the fridge. If I was having a dinner party I could rest easy knowing it鈥檚 all done; I just have to spread it all out on a baking sheet and roast before serving. The crowning touch is that it roasts at a perfectly ballsy high heat of 475掳F, taking what could be a too-sweet recipe and blitzing it into crackly, caramelized warmth with the bitter edge of burnt clementine rinds. After roasting you remove the chicken to a platter, and reduce the sauce down a bit. (Or not; I have made and served this without reducing, too.) You can serve right away or reheat later. Personally I think it鈥檚 best fresh. The result: a gloriously gorgeous platter of food that really could not be more beautiful or more delicious. Run, don鈥檛 walk, to make this chicken. That鈥檚 it. Okay, fine, let me draw it out a little more. This chicken is a dream to make. Once you鈥檙e over the initial challenge of tracking down arak (perhaps exchanging text messages with your significant other at the liquor store as they offer up options 鈥�is this it? This?) the rest of the cooking is all downhill. 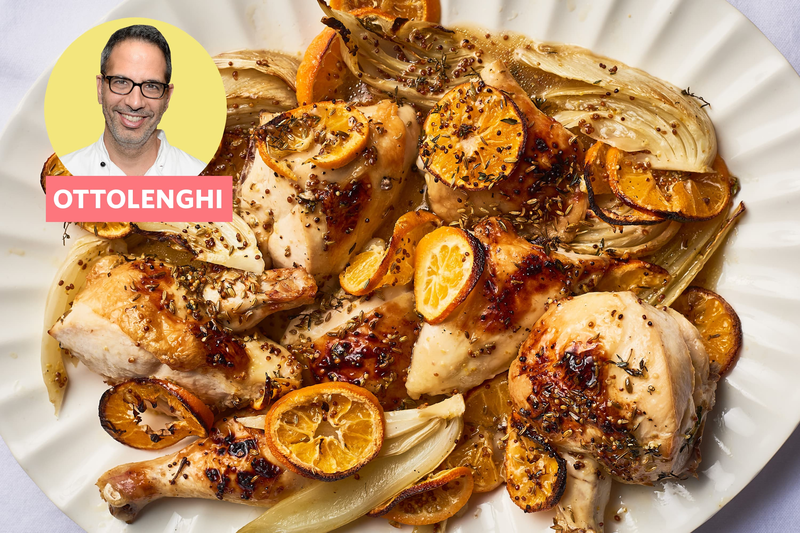 Just tossing this together in a bowl is pure pleasure as you smell the anise liquor and the grassy fennel, slice those clementines and pile them on the chicken, mix in the pungent mustard. Each step is beautiful, which is just about the rarest thing I can think of for a chicken recipe! And then once you have all these ingredients, many of them keep well. The arak, the mustard, the fennel seed 鈥� they鈥檙e all waiting for you to make it again. This is how much I liked this chicken: less than a week later I made a double batch, kept half for my family, and took the other half to a friend with a new baby. In fact, this chicken seems to have a particular life for new parents. At least two other recommenders specifically mentioned making it for postpartum mothers. I don鈥檛 think that鈥檚 an accident. 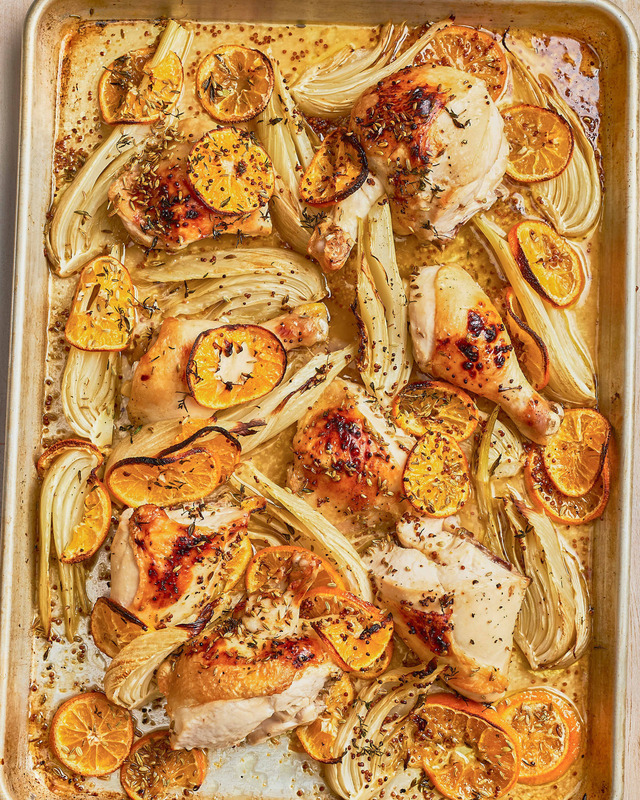 It is a sheet-pan meal, glorified and glamorized, absolutely gorgeous with these little wheels of citrus, and hearty and delicious with just enough sweetness. It鈥檚 celebration on a platter, without sacrificing the scrummy bits that make cold chicken exactly what you need in the middle of the night. Definitely better than a bouquet of flowers for sheer life-preservation. A few tips if you take my (and my friends鈥�) advice to try this out. 1. The fennel is essential: Look, I know lots of people don鈥檛 like fennel. I have things I don鈥檛 like too. I won鈥檛 try to talk you into making this if you鈥檙e truly one who loathes fennel in all its forms. But I will say, if you鈥檝e only ever tried and disliked fennel raw, this roasted, blissed-out fennel is all soft and sweet, soaking in the chicken juices. The anise liquor鈥檚 aggressiveness disappears into the mix. If you鈥檝e never had roast fennel, just try it, just once. 2. Roast with the skin up: The recipe mentions this but just let me reiterate: You really want the skin to get dark, blistered, and caramelized. Don鈥檛 be afraid to brown boldly in the oven; chicken thighs rarely taste overcooked, but undercooked skin won鈥檛 be good here. 3. You don鈥檛 need an extra saucepan for the sauce: Ottolenghi says to pour the sauce into a saucepan to reduce, but personally I do it right in the pan, whether that鈥檚 a large sheet pan or an extra-wide roasting pan. Just remove the chicken, and simmer the sauce until it鈥檚 glossy and viscous. Have you ever made this recipe? Any words to share on it? I鈥檇 love to know what you think, or whether you have another Ottolenghi chicken recipe more to your liking.